Central heating and air conditioning (HVAC) systems are all controlled by some kind of wall-mounted thermostats that sense room temperature and turn the systems on and off whenever necessary. There are quite a number of different thermostat styles, ranging from the old standard mercury-contact thermostat in the familiar Honeywell dial style, to extremely modern digital thermostats that operate entirely by touch-screen controls. One thing they have in common, though, is that virtually all of these thermostats are low-voltage devices powered by transformers and connected to the furnace and/or air conditioner with a series of low-voltage wires. When an existing thermostat goes bad, it's a fairly easy matter to replace it. 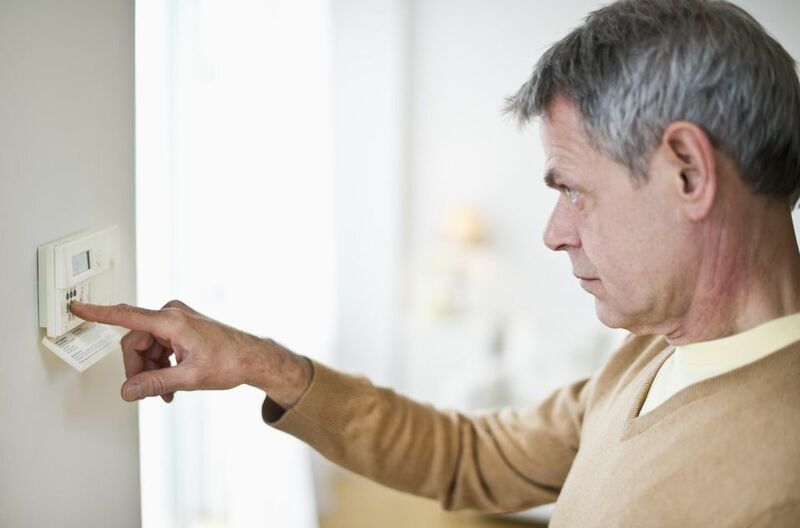 Most new thermostats come with directions for how to adapt the device for different systems—and this is fortunate, because an HVAC system may use as few as two wires or as many as four or more, depending on how many components there that need to be controlled. For example, if the thermostat operates only a boiler, there may be only two low-voltage wires to connect, while a thermostat that controls a forced air furnace, central air conditioner, and a heat-exchange filter, may have as many as five wires. Many modern thermostats will work for simple as well as complex systems—it's just a matter of how many wire connections you'll need to make. But it's also a waste of money to buy a thermostat that has more capabilities than you need. In a very common thermostat configuration, where the device controls a combination forced-air furnace and air conditioner, the thermostat usually has only three basic wire connections: one wire that controls the fan, another that turns the furnace ON and OFF, and one that controls the air conditioner. Very often, a misbehaving thermostat is simply in need of some easy repairs. But when this doesn't work, replacement is your only option. And you may want to replace a thermostat simply to take advantage of new features such as programmability, which isn't found on older thermostats. Choosing the right replacement thermostat can be a little bewildering, considering how many features are now available. Further confusing the issue is the fact that most thermostats available will claim to be suitable for all central HVAC systems. While this may be true, adapting a very sophisticated thermostat to a very simple HVAC system can be needlessly complicated. It is best to buy the thermostat you need, not one that has features you don't want or need. Does your furnace system only a heating system, or does it also have a forced air conditioning unit? Make sure to choose a thermostat that's appropriate to your needs. Do you want programmability, and if so, how many programs do you need? What brand of furnace and air conditioner do you have? Does the thermostat manufacturer specify compatibility with your system? If possible, consult the contractor who installed your original system for recommendations on what replacement thermostat to use. When buying through an online retailer, read the customer reviews carefully—you can even pose a question of your own and ask if a particular thermostat works for your furnace. Most thermostat manufacturers now offer PDF installation manuals online, which you can read before you even buy the thermostat. First, you must disconnect and remove the old thermostat, carefully noting the number of low-voltage wires present and what terminals they are connected to. Ideally, the wire colors will match up with the thermostat terminals, but this isn't always the case, especially if the thermostat was installed by an amateur. Carefully note where the wires are connected so that you can duplicate the connections when you hook up the new thermostat. Shut off power to the furnace. You will find the circuit breaker that controls the furnace in the electrical service panel or fuse box. Find the correct circuit and turn it off by flipping the circuit breaker lever to the OFF position. Remove the cover on the old thermostat and expose the low-voltage wire connections. With some thermostats, the entire body of the thermostat detaches from a wall plate, while with others it is just a cover that pops off the thermostat body. Take careful note of what terminals the low-voltage wires are connected to. It is a good idea to take a digital picture of the wires, or you can take written notes. Disconnect the wires from the thermostat, being careful not to let them fall back into the wall cavity. Label the wires with masking tape to indicate the terminals they were connected to. Usually, the terminals will be labeled with letters, such as "Y," "B," "R," etc. Remove the old thermostat mounting plate from the wall. Usually, this involves removing mounting screws that are driven into the wall. As you install the mounting plate for the new thermostat, take care to prevent the low-voltage wires from falling back into the wall cavity—a very common problem. Thread the low-voltage wires through the hole in the new mounting plate. Position the mounting plate against the wall so that the wire opening is aligned with the hole in the wall. Use a torpedo level to level the mounting plate, then mark the location of the mounting screws on the wall. Loosely attach the mounting plate screws, check for level, then tighten screws until the mounting plate is secure. Do not overtighten. Tip: On wallboard walls, you may need to drive plastic anchors at the mounting screw locations in order to firmly anchor the thermostat's mounting plate. Once the mounting plate is fastened to the wall, the next step is to connect the wires. Attach the wires to the appropriately marked terminal connections on the new thermostat, according to the tags you placed on the wires. Depending on the thermostat style, this may mean attaching the wires to screw terminals, or slipping them into friction-fit slots. Consult the manufacturer's instructions for details on this. Once the wires are connected, tuck excess wires against the mounting plate or into the wall. Once the wires are connected, all that's needed is to attach the new thermostat body and set your controls. Snap the new thermostat onto the mounting plate, making sure the electrical contacts are correctly seated. Turn the power ON to the electrical circuit that powers the furnace. Check to make sure the system is operating properly. Turn the temperature setting to a high level and check to see if the furnace turns on; call for a low temperature to check the operation of the air conditioner. Once you are sure the thermostat is operating properly, you can set the programming modes for automatic operation.